It's time for a new release of FarCry, and well past time for a new and fresh default FarCry installation: a new design, and new content. It is time ... for a skeleton. A FarCry skeleton is basically a serialized FarCry app, ready to be un-serialized by someone else. So to make a new skeleton, you need an existing project first. Log into the webtop and go to Content -> Content Publishing -> Content Export -> Export As Project Skeleton, and fill out the form. After the skeleton is created you will see an alert saying "Skeleton Exported Successfully", and there will be a new folder in your project "install" with a bunch of WDDX files in it. That's it. You now have a skeleton. 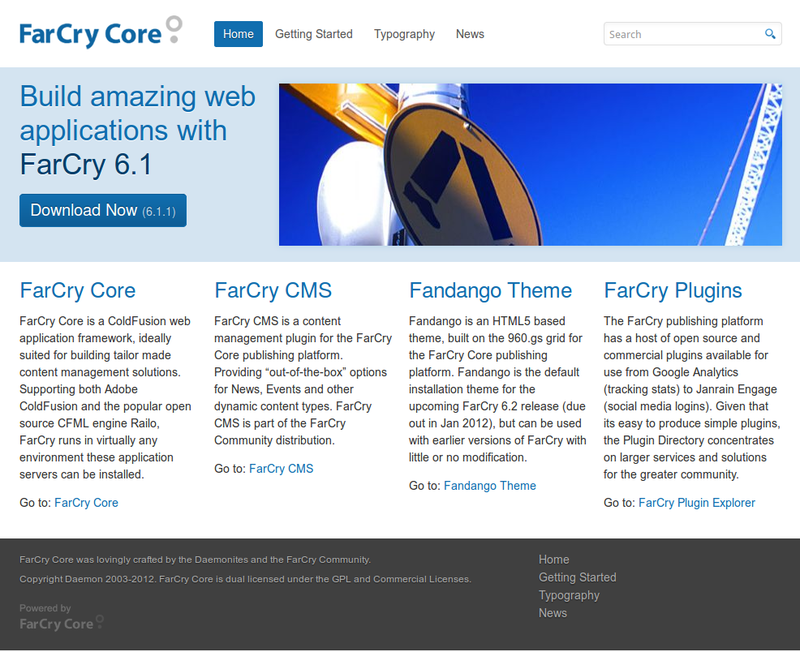 If I go to install another FarCry application on this server I will see Fandango as an option. And I can give the project folder to someone else to put in their "skeletons" directory and install themselves. This makes it really easy to update a skeleton - just keep the original application running somewhere and re-run the export step when you need to.